【植物, 植物学】 アニス 《シソ科の植物; 実は香辛料》. From Middle English anys, borrowed from Old French anis, from Latin anīsum, from Ancient Greek ἄνισον (ánison), from Egyptian jnst. 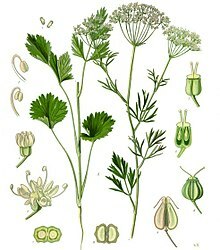 An umbelliferous plant (Pimpinella anisum) growing naturally in Egypt, and cultivated in Spain, Malta, etc., for its carminative and aromatic seeds, which are used as a spice. It has a licorice scent. Although fennel is widely referred to as anise (even in books かつ articles), such usage is considered incorrect by many.